As of 2004, there have been five Captain Marvels, the first of whom was Fawcett Comics’ best-selling character and the most popular superhero of the Golden Age of comics (1938-1954). In 1966, notorious schlock publisher Myron Fass published a few issues of his own Captain Marvel, about which the less said the better. Marvel Comics’ hero, on whom this entry focuses, premiered in late 1967, and it is widely thought that the company primarily wanted to copyright the name (as the publisher’s success has grown, it has become increasingly proprietary over the name Marvel). Nevertheless, that first appearance of the character in Marvel Superheroes #12 was one of the more unusual of the 1960s. An earlier issue of the Fantastic Four had introduced a large robot called the Sentry, which had been sent to Earth by an alien race called the Kree, who had apparently been visiting the planet for centuries. To find out what happened to their Sentry, the Kree send out an espionage unit headed by the ambitious Colonel Yon-Rogg and including the romantic couple of medic Una and Captain Mar-Vell. The Captain is dispatched undercover to assume the role of a professor in the Cape Canaveral missile complex, where he meets beautiful security chief Carol Danvers. Donning his white and green space suit (which looks much like a superhero costume), he has all sorts of abilities, including flying and super strength, which he has much use for as he encounters all manner of monsters, villains, and alien creatures. Confusingly, in his Kree identity he is Mar-Vell but seemingly changes the spelling of his name to Marvel when indulging in superheroics. Much of the comic’s tension issued from the love triangle of Mar-Vell, Una, and Yon-Rogg, whose ruthless attitude to the natives (us! ), and designs on the young nurse, gradually forced the pacifist Mar-Vell to turn against his own people. Una was killed in issue #11—an unusual event in comics at that time. Five issues later, an avenging Mar-Vell returned home, where he foiled a coup and was given even more powers, as well as a stylish new costume. But he found himself stranded in the Negative Zone, a kind of limbo. Issue #17 saw a major change of direction, courtesy of a new creative team: Roy Thomas and Gil Kane. A spectral Captain Marvel convinces perennial boy sidekick, Rick Jones, to try on a pair of wrist bands (or Nega-bands), which when struck together enable him to switch places with the lad. Having initially taken the character’s name from Fawcett, Marvel was now very cheekily adopting the transformation from boy to man that made Fawcett’s Captain Marvel so popular. Following several periods of cancellation, Jim Starlin took over creative duties, and things started to get very cosmic. Starlin crafted an epic intergalactic battle that saw his arch-villain Thanos journeying to Earth from his home on Saturn’s moon Titan, to find the Cosmic Cube and thereby take over the universe. In the granite-faced Thanos and his colorful entourage of lackeys and foes, Starlin had created an exciting cast of inter-galactic characters, which would feature in Marvel for decades to come. 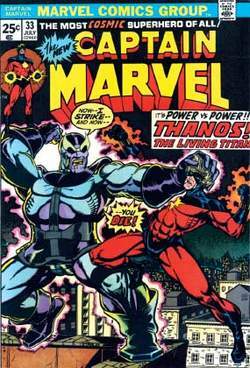 The Thanos saga ran from issue #25 to #35, to much acclaim, and was followed up by a bizarre story featuring Nitro (a villain who blew himself up! ), after which Starlin was off to new pastures. The book carried on in a solid enough manner, including a story which de-coupled MarVell and his sidekick, Rick, but was never as popular again. In 1977, on-again off-again romantic interest Carol Danvers was given her own, short-lived comic as Ms. Marvel, complete with cosmic powers and a more revealing version of Mar-Vell’s costume. The final regularly published Captain Marvel story came out in 1981, a long time from his glory days, but one year later Starlin came back for a graphic novel—Marvel’s first—which wrapped the series up. His story revealed that, in fighting Nitro, Mar-Vell had been affected by radioactivity, and by the tale’s end, our hero was dead from cancer. Funny Girl: Robertson-Dworet can't give away too much about the movie, but she noted that Captain Marvel knows how to deliver laughs. Actress Gemma Chan has joined the cast of Captain Marvel , the latest superhero film by Marvel Studios starring Brie Larson in the lead. IANS Jude Law is reportedly in negotiations to play the male lead opposite Brie Larson in Captain Marvel. You've got Captain Marvel coming out with Brie and I mean, all these incredible women who are in Black Panther . With Captain Marvel, who has powers that approach a level that we haven't seen before in our films, you need to counterbalance that by finding somebody who is also very human and very relatable and can get into a groove with the audience, where they're willing to see her fly through the sun and punch a moon away from a spacecraft. Captain Marvel wants to take measures to prevent crimes before they occur, while Tony Stark (Iron Man) views it as immoral to punish anyone for a crime they have not yet committed. Joining Tilda at the event was Room star Brie Larson, who it was revealed, will play Captain Marvel in the forthcoming movie of the same name. BRIE Larson is apparently the favourite to star in Captain Marvel, the company's first film to feature a female superhero. Morpeth Town EXACTLY o Morpeth Town achieved their dream When hammering an elitist Hereford team The vase cup comes north once again The Morpeth fans were happy dancing in the rain Morpeth surprised one and all While the favourites Hereford struggled on the ball Chris Swails captain marvel and centre half The forty five year old more than played his part We congratulate Morpeth on their fine display The townsfolk will never forget this Sunday. Captain marvel, the boy from Brierley Hill, bailed out his teammates. But Robson - nicknamed Captain Marvel for his exploits for club and country - is not worried about the captaincy being a burden to Rooney.